Disclosure: This post contains affiliate links, which means I earn a small commission if you make a purchase through that link. This acts as an advertising fee from the store and does not cost any extra for you. Thank you! First, a few facts! Did you know that the pet industry is a $69.5 billion industry? That’s larger than the jewelry, hardware, and movie industries — and only slightly smaller than those three industries combined. People love their pets, and brands are stepping up to the plate with innovative solutions for pet parents’ everyday problems. A very tiny sampling of the show floor. It was HUGE! Global Pet Expo 2018 featured a show floor that was 1/3 mile long, covered in 3,523 10×10 booths that were home to 1,164 exhibitors. Did I get the chance to see everything? Nope, but I tried! Pet food companies are finding ways to jump on the raw feeding and raw-inspired bandwagon with ways to enhance traditional kibble. Fruitables, for examples, was displaying their new Broth Bowls broth and Puree toppers. Brands like The Honest Kitchen and Wellness CORE are also hopping in on the action with their Bone Broth supplement and Tender Bites topper. Almost every food brand booth I visited featured some new dehydrated topper or supplement. I don’t know why, but I love dog toys that look like food! Fruits and veggies seemed to be the most popular, but we also saw lots of pizzas and donuts. I was absolutely obsessed with the Fluffy Sprout toy from Petface (top left in the photo above) and its flappable (is that the right word?) leaves and adorable face! At the P.L.A.Y. booth, I discovered that the brand has redesigned Henry’s #1 Favorite Toy of All Time, the corn toy pictured above. The only major change was that that corn part is now nubby instead of a flat, printed fabric — I think Henry would approve even more than he already does! Also — a pepper toy? I don’t think it can get any cuter. Brands are making it super easy to celebrate your pup’s big day! Lord Jameson Dog Treats debuted their new Birthday Bash flavor (pictured above), balled goodies decked in festive multicolor coconut. They’re delicious — I know because I tried one! Pawty In a Box makes party time a snap with their pre-packaged themed boxes that include goodies such as party hats, bow ties, collar flowers, and banners. Their new Unicorn theme (pictured above) is absolutely gorgeous! Unicorns are EVERYWHERE — fashion, food, and even the makeup industry — so it’s no surprise that they’ve found their way to the pet sphere. If I shared every unicorn-themed product I saw at Global, I would have to make it a multi-part series. Not that I’m complaining — I personally think it’s all terribly adorable! SnugArooz, a new brand to Global Pet Expo, made unicorn toys in several colors. (Can I collect them all?) They even offered a sweet version of the popular “unstuff me!” dog toy format with several unicorns inside a rainbow. There was a larger-than-life version as well (above), which I really just wanted to crawl inside of and snuggle up after several days on my feet. As a knitter, I’ve always been a big fan of the adorable sweaters from Chilly Dog. When I saw the above sweater at their booth, however, I nearly lost it. HOW. CUTE. IS. THAT? The colors were vibrant and happy, and the gorgeous knitting almost made me wish I was home in Rhode Island in that day’s snowstorm instead of in Florida. Along with several other delicious-sounding flavors like Monkey Bread and Burgers & Fries, Bocce’s Bakery is now offering Unicorn Shake flavored treats. IS THERE A HUMAN VERSION? (Besides, of course, the actual Unicorn Shake). These treats also illustrate that fact that a lot of pet food brands are looking to human food trends for inspiration. Cats didn’t miss out on the unicorn fun, either! Check out that unicorn donut (the most perfect amalgam of megatrends I’ve ever seen) and the cute pink ‘corn to the right. Dogs are in on the bath bomb trend, too! At least two vendors were advertising bath bombs for dogs. I’m not sure about your dog, but I don’t think Henry would tolerate the tub long enough to reap any benefits. That wouldn’t stop me from buying it, though! I’m on a “Nice Bar Soaps That Make Me Feel Like a Fancy Adult” kick lately, and I loved seeing the varieties meant for pooches! In addition to bar soaps and bath bombs, I saw a lot of grooming products touting the natural benefits of essential oils — another trend that started in the “human grooming” sphere. I didn’t get as many pictures as I would have liked in this category (or in general, if we’re being honest), but CBD was HUGE! I talked to at least six CBD- or hemp-oriented brands at Global, but there were many, many more than that. CBD (cannabidiol — a compound from the cannabis plant) is a hot topic across the country, especially in pet care. We’ve tried it for Henry (and written a post about our experience with Treatibles) and have had some success with his anxiety and reactivity. CBD will not get your pet high, and brands tout many benefits from pain relief to combatting seizures. The reason that I took a photo of the product above is that is was such an interesting combination of two big dog trends: CBD and spent beer grain treats! Petmate and La-Z-Boy have joined forces to bring ultra comfort to your dog’s bed! Petmate had several of the beds from this collection in their booth and, I have to say, they seemed really comfortable! The line aims to bring ultimate comfort, design, and craftsmanship to pet bedding with innovative shapes and materials. Messy Mutts — a brand I mostly knew thanks to their amazing grooming mitt — highlighted their new beds with Everfresh probiotic anti-odor technology. I know, I know — probiotics for anti-odor? Aren’t they usually used for gut health? Yes, but in this case, they’re used to naturally break down odors. I could explain it wordily, but I will instead encourage you to check out their website when you’re done reading this article. It’s environmentally friendly, natural, and non-toxic. Henry rarely sleeps in his own bed, so it isn’t very stinky, but I would love to know how this works for other dog owners. This next section is basically my birthday list (and maybe wedding registry) in its entirety! There were many booths showcasing the most adorable goodies for pet-loving humans — sure, we tend to spend a lot of money on our pets, but that doesn’t mean we don’t like to treat ourselves! I knew P.L.A.Y makes adorable and innovative dog toys — but I didn’t know that they also sold some of the cutest totes I’ve ever soon! It took all of the self-control I possess not to run off with everything at the Pet Shop by Fringe Studio booth. Everything was excellently designed, well-made, and just so darn cute! 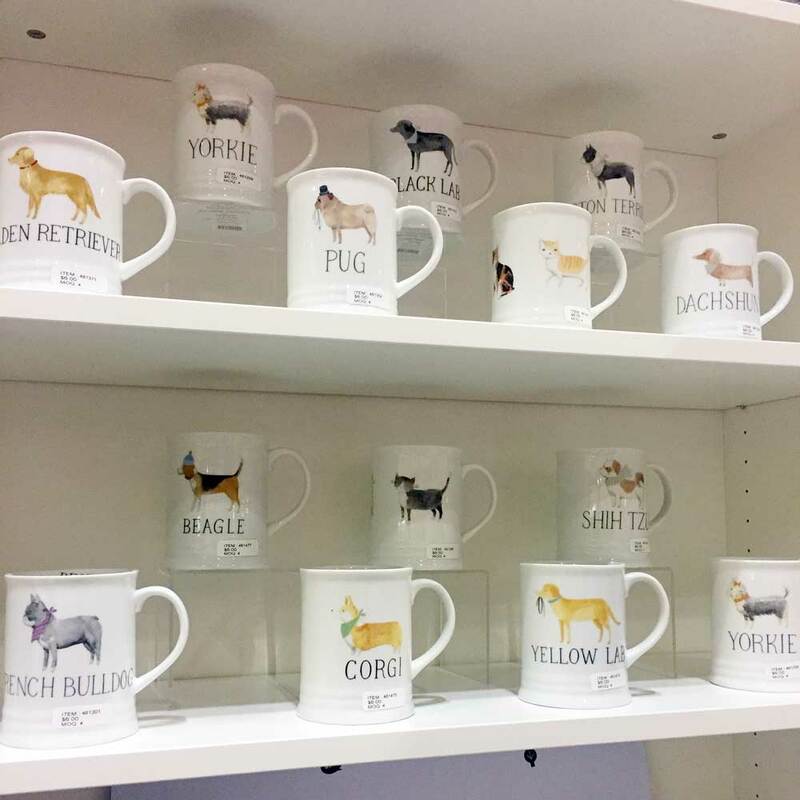 Mugs from the Pet Shop by Fringe Studio booth — can I have one of each? Another mug from Pet Shop by Fringe Studio. There is a French Bulldog in a beret. I REPEAT: THERE IS A FRENCH BULLDOG IN A BERET. One of my FAVORITE booths in the entire expo was the Primitives by Kathy booth. Each and every item (and there were lots of items!) was witty, well-designed, and positively giftable. (As long as you’re gifting them to me!) You can find the towels above here. Adorable bandanas, socks, bags and more from Primitives By Kathy! One of my favorite items from the show — I bet we can all relate! Buy it here! From Primitives By Kathy. Which trend is your favorite? Is there a trend you wish would take over the pet word? Which product would you buy?